I was listening to recent podcast by Taylor Otwell, Laravel Snippet episode 11, where he touched on the debate in Laravel community on where you should put your code logic - in Controllers, Models, or Services. Here's what he said. Really popular Laravel Media Library package has one less-known feature - image resizing. The best part is that it's really simple to add, let me show you how. One of the most common performance issues I've seen in Laravel is using Eloquent methods and relationships from Blade, creating unnecessary extra loops and queries. In this article, I will show different scenarios and how to handle them effectively. 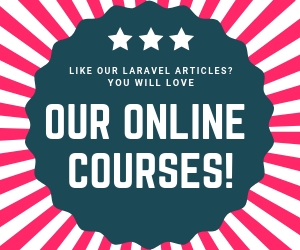 This week I've launched a new online course called Datatables in Laravel, and want to invite you to enroll. Here's what you will get inside. One of the new features in Laravel 5.8 allows you to not register your policies in AuthServiceProvider, they will be "guessed" automatically. Here's how it works. There is one change in Laravel 5.8 that is not mentioned in the official Upgrade Guide but caused me problems - I couldn't create a foreign key migration, and spent half-hour until found out the reasons. So I want to share, maybe you will encounter the same thing. Laravel is a good framework to create "software-as-a-service" solutions - with monthly payments by users. Usually, it should incorporate some kind of Free Trial mechanism. In this article, will show you my version of how to do it in Laravel 5.8. If you need your users to be able to download multiple files at once, it's better to create one archive and let them download it. 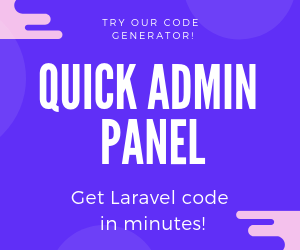 Here's how to do it in Laravel. I have been to three Laracon EU conferences in Amsterdam (will likely be there in 2019, too, see you there? ), and it's a great vibe. And usually one or two talks per year just strike it with really high quality and relevant topics. I decided to search official playlists and bring you my favorite top 5 videos every Laravel developer must watch. Why use $appends with Accessors in Eloquent?